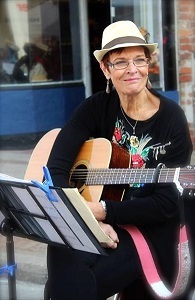 Joanne Hodgson - A folk-based songstress and acoustic guitar musician for over 30 years. In December 2016, Jo was the Opening Act for the Brampton Folk Club’s (BFC) Christmas Concert (for headliners The Foggy Hogtown Boys). Jo has been influenced by Joan Baez, Carole King, Dylan and more recently John Mayer, Serena Ryder and the Fray. She performs primarily covers and is an active member of both the BFC and Flower City MusicFest groups. Having just moved to Barrie, she also belongs to the Parks & Recreation Weekly Jam group. Music is at the soul of everything she does! Through the supportof the BFC,Jo performed at Brampton’s Gage Park Thursday Evening Music Program, The Canada Day Chinguacousy BFC Concert, The Rose Theatre Outdoor Stage and several BFC Showcases. For 2 years she has also busked at the Brampton Farmer’s Market. In addition, Jo has been on the Programme (with solos, duets and group pieces) for many of the Music Fest Concerts at the Flower City Senior’s Centre and has performed at the Good Vibes Café in Moonstone, near the family cottage. She also presented a solo Christmas concert to the Brampton chapter of the ladies Probus Club and now is performing in and around Barrie. Contact information: johosolo60@gmail.com for more information.